What Ninja Forms Triggers and Actions are Supported? New Form Submission - Triggers when a form is submitted. 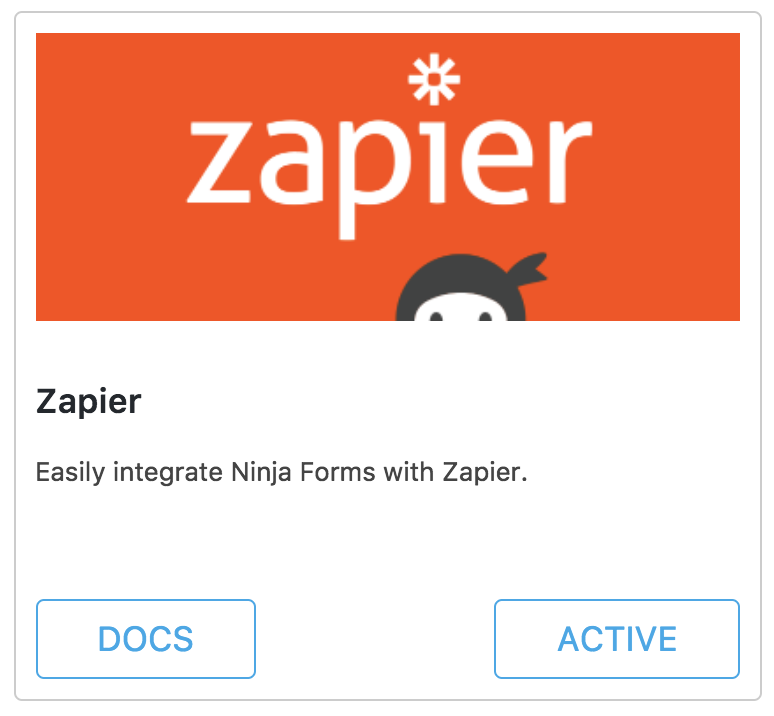 Getting started with Ninja Forms on Zapier needs a little bit of set up on your WordPress dashboard first, but with these steps, you will be able to get your Zap up and running. Install both Ninja Forms and the Ninja Forms + Zapier Add-On plugins in your WordPress dashboard. You can confirm that your add-on has been added successfully by going to Ninja Forms > Add-Ons and making sure the add-on is active. In your Zapier account, create a new Zap by clicking the "Make a Zap!"" button and choosing Ninja Forms as your Trigger app. Select the New Form Submission trigger. You will be taken to a tab where you can copy the Web Hook URL. You can create a new form or choose an existing form to use in your Zap in Ninja Forms > Dashboard. Click on the Edit tool button for that form and then select the Email & Actions tab. Click on the + symbol to add a new action for this form. Here you will choose Zapier from the list of all of the available add-ons. Paste the Web Hook URL from your Zap editor into the Zapier Web Hook field and click "Publish" to save your changes. Preview your form or view it live on your website and fill it out completely. Then, submit the form. This will send Zapier the test data so that we can sync your form. After your form has been submitted, go back to your Zap Editor and click on the "OK, I did this" button. That will let us find that submission and finish the connection to your form. If you decide to make any changes to your form, you will want to re-test this step and then re-map all of the fields in your template to make sure that we are working with the correct information. If you receive a "Test Successful" message, you can click the "View your form" link to make sure that all of the text has come through. If you do not receive this success message, click the "Try Again" button, and then click the "OK, I did this button" again. Right after you click this button, add a new submission to your form. That will give the Zap new information to find and connect to. You're done!. The Zap is now able to find all of your form's fields and you can continue on to setting up the next step in your Zap.